Samsung Galaxy Tab 7.7 Announced! 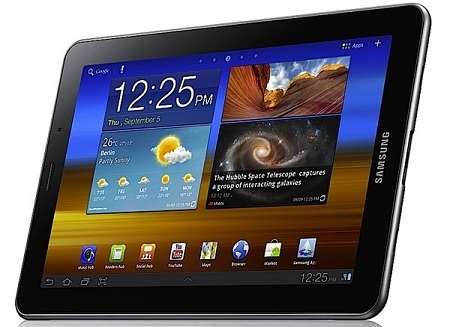 Samsung have announced their new tablet, the Galaxy Tab 7.7 . As you might have guessed, the tablet has a 7.7" Super AMOLED Plus screen, I'm so excited about this on a screen that large, it will be absolutely beautiful! It also runs Honeycomb with Samsung's TouchWiz enhancements. It looks like a great update to the original Galaxy Tablet, fixing the screen issues the original had, whilst introducing the latest internal specs. Samsung Galaxy Tab 7.7, World's First Mobile Tablet Featuring Super AMOLED Plus Display Unveiled at IFA 2011 Pioneer of the 7-inch mobile tablet introduces next generation Galaxy Tab, delivering the ultimate in viewing quality and portability BERLIN â€“ Sept. 1, 2011 â€“Samsung Electronics Co. Ltd., a leading provider and innovator of award-winning consumer electronics, today announced the Samsung Galaxy Tab 7.7, the world's first tablet to feature the brilliant Super AMOLED Plus display. The powerful Galaxy Tab 7.7 with a 1.4GHz dual core processor measures just 7.89 millimeters thin and weighs only 335 grams (12 ounces), making this tablet one of the most portable devices in the market. "The new Galaxy Tab 7.7 demonstrates Samsung's commitment to offering consumers the most choice in the mobile tablet market," said JK Shin, President and Head of Samsung's Mobile Communications Business. "The Galaxy Tab 7.7's ultra-thin design and WXGA Super AMOLED Plus display are impressive differentiators in the tablet marketplace and pillars of our ultimate goal of meeting a wide variety of consumer needs." Brilliant Super AMOLED Plus display The Galaxy Tab 7.7 is the first tablet that incorporates Samsung's Super AMOLED Plus display technology, delivering brilliant, high-contrast colors and a beautiful, crisp viewing experience. The Super AMOLED Plus display allows for a wider range of colors with greater separation between lights and darks, making images incredibly vivid. Sleek Design with Ultimate Portability The Galaxy Tab 7.7 provides ultimate portability and viewing quality within the Galaxy Tab portfolio, featuring a brighter display combined with a thinner and lighter design that easily fits in your jacket pocket or purse. The elegant, linear design features a stylish metal casing and rounded edges for a sleek look that's comfortable to hold while you're sitting or walking. Impressive Speed, Power & Battery Life The Galaxy Tab 7.7 features HSPA+ 21 Mbps network for faster uploads and downloads. It also supports Wi-Fi Channel Bonding, bonding two channels into one for improved network connection and data transfer at up to twice the speed. The device is powered by a 1.4 GHz dual core application processor for fast web-loading, seamless multitasking and superior multimedia performance. Thanks to a 5,100 mAh battery providing up to 10 hours of video playback time, the Galaxy Tab 7.7 does not sacrifice battery life for its ultra-thin design. Latest 3.2 Honeycomb OS with "Samsung TouchWiz UX" The Galaxy Tab 7.7 is powered by Androidâ„¢ 3.2 Honeycomb, Android 3.2 has been optimized for a 7-inch tablet with a new compatibility zoom mode. This optimizes applications that are not designed to run on larger screen sizes, so they fit on the entire screen without distortion. In addition, the tablet supports MicroSD cards of up to 32 GB for direct media files transfer. Samsung's TouchWiz user experience is designed with a Live Panel menu for customizing the home screen of the Galaxy Tab 7.7 with digital pictures, favorite Web sites and social network feeds. In addition, the TouchWiz UX includes a "Mini Apps" tray of commonly used features such as task manager, calendar and music player which can be launched while other major applications are already in use. The clipboard feature allows users to copy and paste texts and images. Powerful Multimedia Galaxy Tab 7.7 lets you enjoy video clips without limitation, featuring 1080p full HD playback, DivX included multi codec and Micro SD. The device also includes Universal Remote Control functionality, allowing control of the entire home entertainment system â€“ TV, Set top box, DVD, Blu-ray player, AV audio system â€“ from one device. Samsung Hub Services [AVAILABILITY DEPENDS ON MARKET] Samsung's Hub Services offers easy access to content including games, eBooks, music and more. The Galaxy Tab 7.7 is the first mobile tablet to include a pre-loaded Game Hub, complete with easy social games, all delivered with lightning fast graphics. The Galaxy Tab 7.7 also features access to Samsung's Music Hub service, which offers 15 million songs for preview, download and play. The Readers Hub service features a robust library filled with more than 2.3 million books, 2,000 newspapers and 3,000 magazines in up to 49 languages, and Samsung's Social Hub service aggregates email, contacts, calendar and social network connections into a single interface. Voice and Video Support for Better Communication The Galaxy Tab 7.7 offers both voice and video calls for better communication. There is no need to bring a headset and BT for voice calls. In addition, it is possible to call privately in public places with Receiver Mode. Googleâ„¢ Mobile Services The Galaxy Tab 7.7 is preloaded with the full suite of Google Mobile Services including access to more than 250,000 applications on Android Marketâ„¢, Gmailâ„¢, Google Searchâ„¢, Google Mapsâ„¢ 5.7 with 3D maps, and Google Talkâ„¢ with video and voice chat.